The sun has been trying to come out here in recent days and the temperatures are starting to climb ever-so-slightly. This coupled with the arrival of March and slowly lengthening days make it feel like spring is really on the way. All these springy feelings prompted me to grab a young green cabbage at the fruiterer’s on Saturday. I’ve been in the mood for fresh, light food recently — probably because I just had to finish all that carrot cake last week — so I spent a couple of days mulling over cabbage possibilities. On Monday during my yoga practice — I know I’m supposed to be focused on my breath and the poses, and I was! But I also happened to be thinking about cabbage — I thought lime and tahini would go well with a simple cabbage salad. So I chopped the cabbage, grated a carrot, threw in some peanuts, and shook up a 3-ingredient dressing. The result? Pure, fresh yum. Shred the cabbage and put it in a colander. Sprinkle the salt over the cabbage and use your hands to mix it together. Let sit for 30-60 minutes, then rinse the cabbage and let it drain. 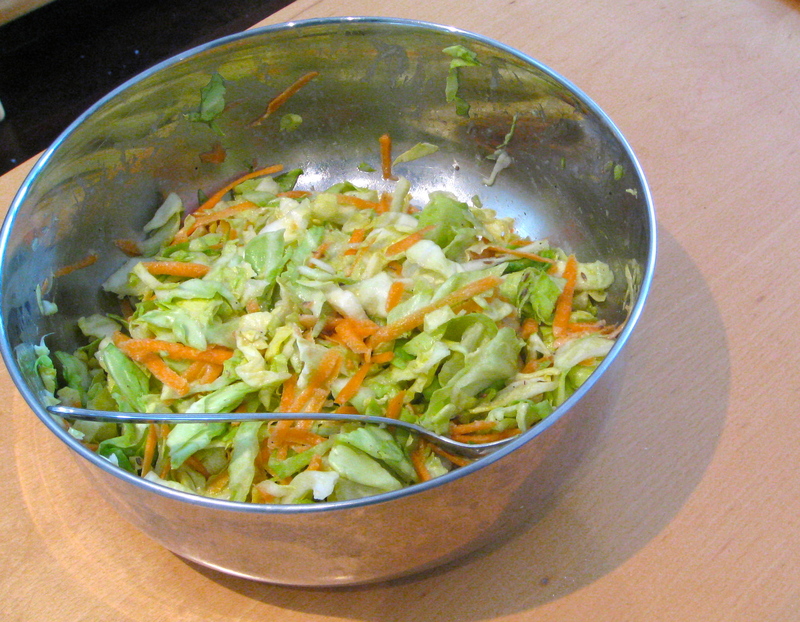 When the cabbage is ready, combine it in a bowl with the grated carrot and peanuts. Put the dressing ingredients into a jar and shake to combine. Pour the dressing over the salad and mix until coated. This entry was posted in climate, food, health, pictures, recipes and tagged salad on 06.03.2013 by taplatt.